Professional Shave & Skincare Since 1953. The Real Shaving Company is a world renowned brand at the forefront of male grooming, offering superior barbershop shave and skincare, since 1953. Combining modern quality formulations with decades of specialist shave expertise, the collection is based around a three step system, which includes cleansers, shave gels, creams and moisturising products for both normal and sensitive skin. It’s professional barbershop shaving at its simplest and all products use the highest quality formulations. It all began by working alongside some of Britain’s finest barbers. Us gents trust the man in the barber’s apron when it comes to a ‘proper’ shave. So together we developed expert, professional products for men, who want that barbershop shave from the comfort of their own home. Say ‘hello’ to proper skincare and take a modern approach to cleansing and nourishing your skin. The vital cleansing process prepares the skin for the next stage by lifting the beard bristles, ensuring the face is soft, squeaky clean and ready for shaving. A barber does this with a hot towel – we have excellent products that do it just as well, and faster. Shave with success using our step 2 products, which are formulated to be exceptionally good at one thing: helping remove unwanted hair from the face, efficiently. The collection is particularly good at helping to prevent cuts or razor burn, leaving skin feeling smooth, healthy and nourished. Prefer a cream to a gel, tube or aerosol? Or is skin sensitive and needs extra hydration? The Real Shaving Co. has a formula to suit your needs, lifting whiskers off the face, reducing friction and resulting in a smooth close shave, free from nicks. Even with the sharpest tools and the best preparation, shaving is hard on skin – and the outside world is tough on the just-shaved. Soothe, hydrate and replenish moisture with one of the step 3 products. If you’re worried about lines and wrinkles, try a product with Q10 technology for visibly younger, firmer looking skin or chose added SPF to provide daily sun protection. For those who like to keep it traditional, a post-shave balm will immediately calm discomfort or irritation from shaving. The Real Shaving Co.’s selection of gifts will make any man in your life happy! Choose from our travel set, shaving brush gift or a selection of favourites in a stylish wash bag. 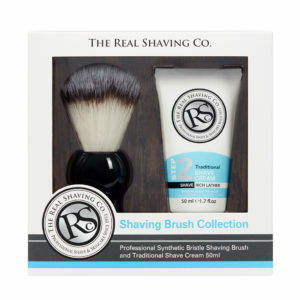 Want to learn more about The Real Shaving Co.? Get in contact with a member of our sales team.